I recently read the award winning novel Weetzie Bat (pub. 1989) by Francesca Lia Block twice in preparation for an episode of Fiction Kitchen Podcast (you can listen to it here) and oh. my. gosh. you guys, there is a fabulous ton of food mentioned within its pages. It's a relatively thin book, a quick read, but seriously chock full of yumminess, mostly from places in LA past and present (with a little bit of New York thrown in). For the podcast episode I made a simple cheese-and-avocado sandwich that was mentioned early on in the book, as well as an original "inspired by" Weetzie Bat mocktail, but there was also another food that stood out to me, actually on the same page as the sandwich. "In the daytime, they went to matinees on Hollywood Boulevard, had strawberry sundaes with marshmallow topping at Schwab's, or went to the beach." Schwab's on Sunset Boulevard in LA, frequented by golden-age Hollywood stars and starlets, was one of those awesome pharmacies that not only sold typical drug store items like over-the-counter medicine, soap, hair stuff, makeup, etc, but also food like soda pop, ice cream, and sandwiches (I grew up in proximity to a place like this and I loved it so much). Built in the '30s, Schwab's closed it's doors in 1983. 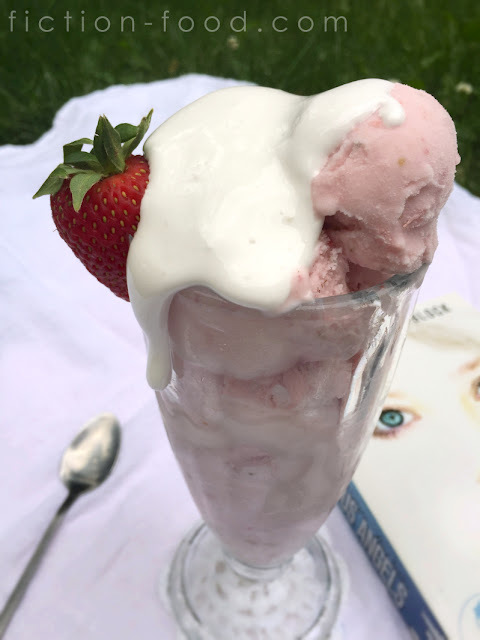 I suppose a strawberry sundae is more often than not simply vanilla ice cream with strawberry sauce drizzled on top, but in my mind, for Weetzie Bat, it's totally pink ice cream, made from fresh strawberries, with pretty, white, fluffy marshmallow topping poured on. I think the marshmallow sauce is what made it stand out to me, as I can't remember having it before with ice cream (I've had marshmallow fluff a'plenty with fluffernutter's and all) and strawberries seem so integral to Weetzie Bat as they're mentioned a few times directly as lipstick, bubblegum, ice cream, fresh with whipped cream, or in essence of color and sweetness throughout the lyrical narrative. Also, booyah is it hotsie totsie where I live right now! Ice cream is very welcome and I've been wanting to experiment with homemaking it, especially since my dad passed his old ice cream maker on to me, so this was good inspiration and motivation. 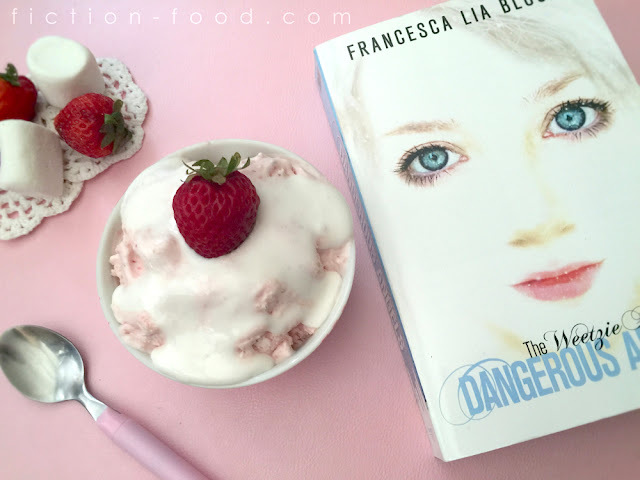 Stay tuned for more fiction related ice cream in the near, Summertime future! Note: As the book says "sundaes", feel free to add sliced banana and hot fudge to your strawberry and marshmallow creation! Maybe even a few chopped nuts or little cake bites! The recipe below uses an ice cream maker, but if you don't have one, pour the blended ice cream mixture into a metal bread pan, cover with plastic wrap, and pop into the freezer. Stir very well every 30 minutes to remove ice build up (you can use a hand held mixer for this if you want) until it becomes firm (at least 2 1/2 - 3 hours). 1. Ice Cream: Combine all of the ice cream ingredients in your blender or food processor & blend until smooth & completely incorporated. Pour the mixture into your ice cream maker & follow the directions for the unit (I have a Cuisinart that uses a frozen bowl & it takes about 30 minutes mixing time to make soft serve & then I transfer the ice cream into an airtight container & freeze it for a couple hours to firm up even more). 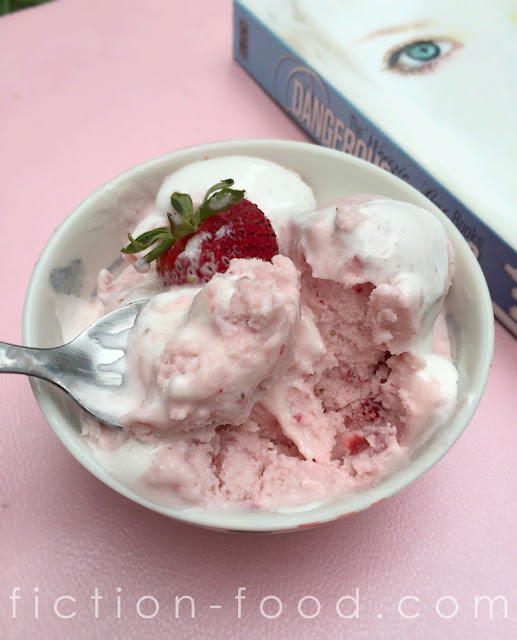 Note: If you don't want seeds in your ice cream, blend the strawberries first, by themselves, & then strain through a fine mesh strainer into a cup. Discard the seeds & pulp, rinse out your blender, & put the strawberry puree into the blender with the other ice cream ingredients & continue from there. 2. Marshmallow Sauce: Pour the cold water & gelatin into a mixing bowl, give it a little stir, & let it set until solidified. In a pot on medium high heat, combine the sugar, 1/4 cup water, corn syrup, & salt. Do not stir. Bring to a boil & continue to heat until it reaches 240ºF on a candy thermometer. Remove from heat & pour into the mixing bowl with the gelatin. Add the vanilla & beat on low speed with a whisk attachment for about 2 minutes, & then increase to high speed & beat for about 14 minutes or until thick/fluffy & shiny. Use immediately or store in an airtight container (will last a few days), heating it a little in the microwave when ready to use to make it pourable (but not super hot & runny!). 3. Serve the ice cream with marshmallow sauce on top & a fresh strawberry for garnish. Share with a slinkster-cool loved one.